New gene editing techniques potentially allow the transfer of agronomic traits into new plant varieties. However, we know too little of the way recoded genetic interactions contribute to altered growth. We need simpler systems and executable biological models to allow predictive design and engineering of new traits. Unlike animals, the final body plan of a plant is elaborated after embryogenesis by the activities of meristems, or growing points. The shoot apical meristem is a population of cells located at the tip of the shoot axis. It produces lateral organs, stem tissues and regenerates itself. In most plants little or no shoot tissue results from embryogenesis: essentially the entire shoot system derives from postembryonic development in the meristem. Plant meristems must regulate organ formation by carefully balancing (i) the maintenance of undifferentiated stem cells with (ii) the commitment of appropriately positioned cells towards differentiation. Genetic mechanisms are in place to maintain the size of the meristem. Genes like Clavata3 and Wuschel form part of a local feedback circuit to regulate stem cell behaviour in the tip of the meristem. Cellular and genetic interactions at the microscopic scale underpin the growth and ultimate macroscopic form of plants. These local, short-range interactions can be recoded, and are responsible for important traits in domesticated crops. Modern tomato varieties emerged from wild Peruvian species (Solanum pimpinellifolium). Two mutant alleles which have played a major role in the breeding of large fruit sizes are locule number (lc) and fasciated (fas). Fas encodes the tomato homologue of Clavata3 (CLV3), and Lc encodes Wuschel (WUS). These genes are crucial parts of the well-characterised CLAVATA3-WUSCHEL negative feedback circuit that controls shoot apical meristem size in tomato, and other plants. Mutant fasciated and locule number alleles result in expanded meristem sizes, which in turn give rise to increased tomato fruit size and locule number. The mutants were identified as agronomically important traits during domestication of tomato. (from Rodriquez-Leal et al. Cell 171, 470-480, 2017). Clavata3 (CLV3) and Wuschel (WUS) genes form part of a feedback loop that regulates the number of proliferating meristematic cells in plants, including tomato. Mutations in the tomato genes result in increased meristem size, which contributes to increased fruit size and locule number. (Locules are indicated by yellow arrowheads). Image: Rodriquez-Leal et al. Cell 171, 470-480, 2017. In a series of important experiments, Rodriquez-Leal et al. demonstrated that it was possible to recreate this important set of agronomic trait by using gene-editing techniques. They used CRISPR-mediated gene editing to create an allelic series of tomato clv3 (slclv3 or fas) mutants which showed a range of quantitative effects on floral organ number with a simple relationship between reduced gene expression and increased phenotypic severity. Similar experiments were performed for the tomato Wuschel gene, and other genes that regulate shoot architecture in tomato. (from Rodriquez-Leal et al. Cell 171, 470-480, 2017). These results demonstrate that it is possible, in principle, to reprogram plant growth and engineer stable agronomically important traits in a new plant. However, the engineering of novel traits requires a deeper understanding of existing regulatory networks. To model and predict the form of reprogrammed plants, integrated, multiscale models for plant growth are required. 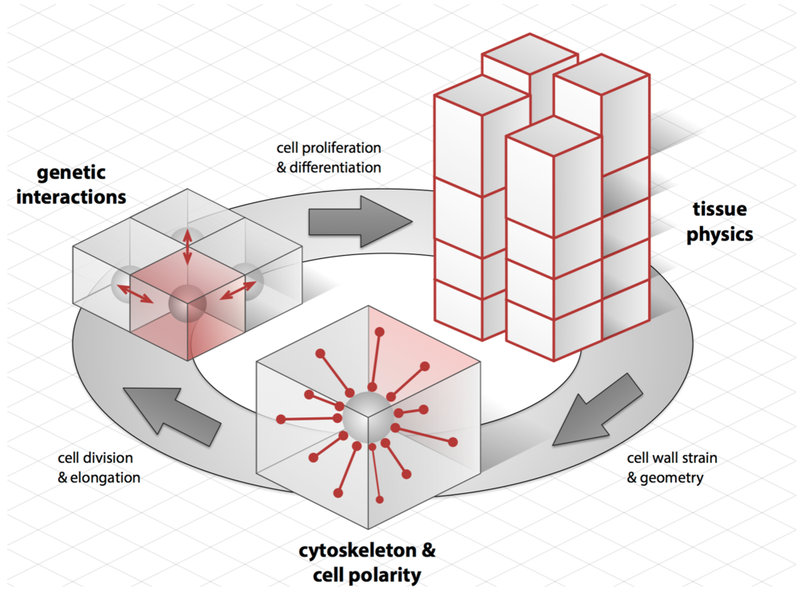 These software models need to capture (i) interactions within cells, including gene regulatory networks, cell polarity, cell wall determinants, and reactions to strain or geometry regulating cell division and expansion, (ii) genetic interactions between neighboring cells that can regulate cell behaviour, and (iii) cellular growth that results in physical strains that are transmitted across tissues and constrain cell growth, because physical constraints on cell size and shape regulate timing and orientation of individual cell divisions and guide morphogenesis. Multiscale models provide an essential tool for engineering multicellular systems. Standardised DNA parts facilitate assembly of DNA circuits that may be introduced into plant systems by transformation, and the performance of DNA-based circuits can be measured using quantitative imaging techniques. Although a genetic circuit may regulate or alter the behavior of an individual cell in an easily predictable fashion, the consequences of altered cell interactions, propagation of changes across large cell populations, changes in tissue-wide physical and chemical interactions, and feedback on the properties of individual cells are difficult to predict. Multi-scale view of plant growth. (i) Interaction between cytoskeletal elements and local cell wall determinants, strain or geometry regulates the polarity of cell division and elongation. (ii) Genetic interactions between neighbouring cells trigger gene expression, cell proliferation and differentiation. (iii) Cellular growth results in physical strains that are transmitted across tissues and constrain cell growth. (iv) Physical constraints on cell size and shape regulate timing and orientation of individual cell divisions and guide morphogenesis.